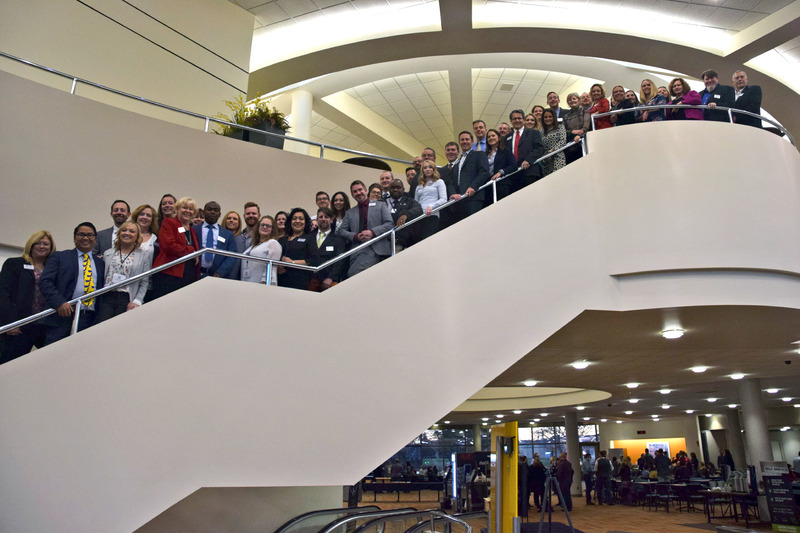 MADISON, WI (November 30, 2018) — Forty-two credit union professionals were certified as Credit Union Development Educators (CUDEs) after completing the National Credit Union Foundation’s Credit Union Development Education (DE) Training. The most recent DE graduating class included credit union movement representatives from across the U.S, as well as two representatives from Ghana. They are: Gilbert Alonzo, PSCU in Arizona; Kimberly Ashline, South Carolina Federal Credit Union in South Carolina; Jessica Baker, SC Telco Federal Credit Union in South Carolina; Catherine Brickner, People’s Trust FCU in Texas; Karen Carson, SchoolsFirst Federal Credit Union in California; Zachary Churchill, USF Federal Credit Union in Florida; Kara Connors, Montana’s Credit Unions in Montana; Mark Cough, Coastal Credit Union in North Carolina; Lori Cushman, CUNA Mutual Group in Wisconsin; Whitley Edelfelt, Laramie Plans Community Federal Credit Union in Wyoming; Dede Farmer, GECU in Texas; Tiffany Ficklin, Nusenda Credit Union in New Mexico; Alexis Friel, Members Choice West Virginia Federal Credit Union in West Virginia; Joseph Garti, Hydro Co-Operative Credit Union in Ghana; Elizabeth Gilligan, Bayer Heritage Federal Credit Union in West Virginia; Vickie Gomez, Landings Credit Union in Arizona; Mike Grady IV, Ent Credit Union in Colorado; Jenny Hamilton, Tarrant County’s Credit Union in Texas; Brandon Hougom, Altra Federal Credit Union in Wisconsin; Jessica Jamison, SchoolsFirst Federal Credit Union in California; Jordan Krall, Credit Union National Association in Wisconsin; Barbra Lowman, Cornerstone Credit Union League in Texas; Jody Mattson, America’s First Federal Credit Union in Alabama; Danny McGuire, Unitus Community Credit Union in Oregon; Steve Mendez, CUNA Mutual Group in Wisconsin; Thomas Meyers, Washington State ECU in Washington; Steve Morgan, Coastal Credit Union in North Carolina; Harry Myers, GTE Financial in Florida; Marella Nardotti, Fairfax County Federal Credit Union in Virginia; Clarence Nash, Resource One Credit Union in Texas; Michael Parks, Suncoast Credit Union in Florida; Daniel Perry, Buckeye State Credit Union in Ohio; Rachael Quinn, BECU in Washington; Stephanie Quiroz, GECU in Texas; Rachel Snyder, CU Business Group, LLC in Oregon; Sarah Snyder, Harborstone Credit Union in Washington; Eddie Vance, Suncoast Credit Union in Florida; Christopher Verdosci, CU Strategic Planning in California; Mark Volz, Corporate Central Credit Union in Wisconsin; Brendan Wilbur, Alternatives Federal Credit Union in New York; Caroline Willard, Cornerstone Credit Union League in Texas; and Johnson Wotu, Ghana Co-Operative Credit Unions Association in Ghana. The program was facilitated by Christopher Morris from the Credit Union National Association in Wisconsin and Josh Smith from SchoolsFirst Federal Credit Union in California. Onsite event coordination was done by Maggie Wolff from the Foundation. The class was mentored by a group of six credit union professionals and CUDE alumni: Kathy Chartier from Members Credit Union in Connecticut; Kristina Grebner from the Credit Union National Association in Wisconsin; Angela McCathran from People’s Trust FCU in Texas; Ty Robins from People’s Trust Federal Credit Union in Texas; Erika Romenesko from CUNA Mutual Group in Tennessee, and Joe Woods from Dolphin Debit Access in Ohio. “Attending DE was an inspiring experience and so much more than expected. The focus on purpose and cooperative principles really magnified why the work we do in credit unions is so important.” – Rachel Snyder, CU Business Group, LLC. “DE was quite literally a life changing experience in more ways than one. The program was fantastic and packed with great take away’s. I can’t wait to bring these back to my credit union and use these skills to further push the credit union movement forward!” – Daniel Perry, Buckeye State Credit Union. “The DE Program was far and away the best experience of my career. I now have a much deeper understanding of credit union history and the overall movement and feel much more prepared to help keep the credit union movement going strong. Whether you are an entry level employee or an executive, this program will change your life.” –Brandon Hougom, Altra Federal Credit Union. Graduates of the November 2018 DE Training stand with training staff inside the World Credit Union Center Campus in Madison, Wis. The National Credit Union Foundation (the Foundation) is the charitable arm of the U.S credit union movement, serving as a catalyst for change in people’s financial lives. The Foundation works to ignite understanding and focus on member financial health, inspire and create opportunities for credit unions to leverage their cooperative values and respond quickly when disaster strikes. Through cooperative support and action, the Foundation helps people achieve financial freedom.